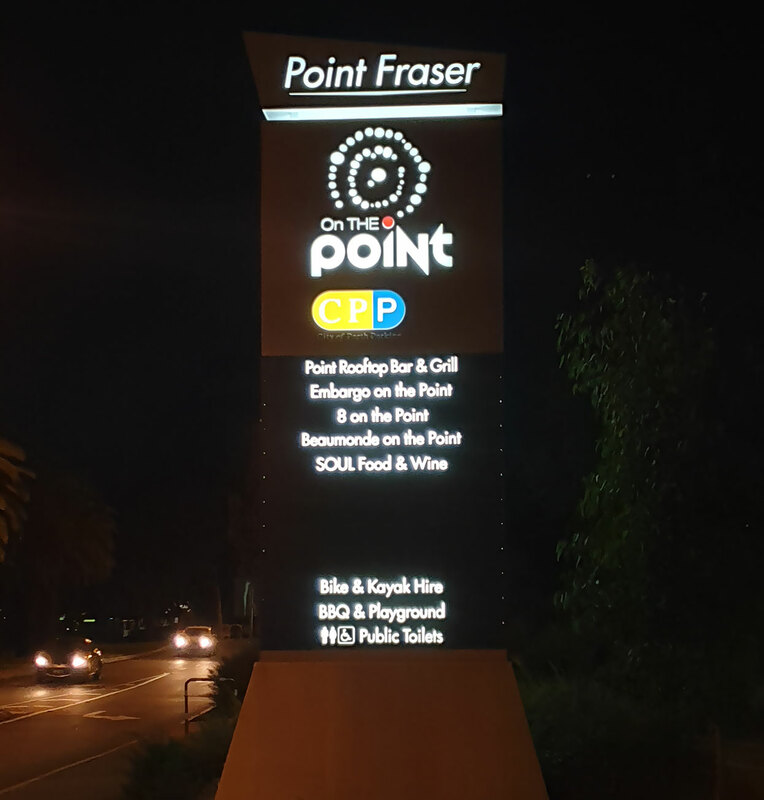 Applecross based design company, Razoreye commissioned Sign Here Signs to build and install illuminated pylon signage for one of their amazing clients. Here’s how the project went down. At Sign Here Signs, we love working with WA businesses who care as much about doing a top-notch job as we do. 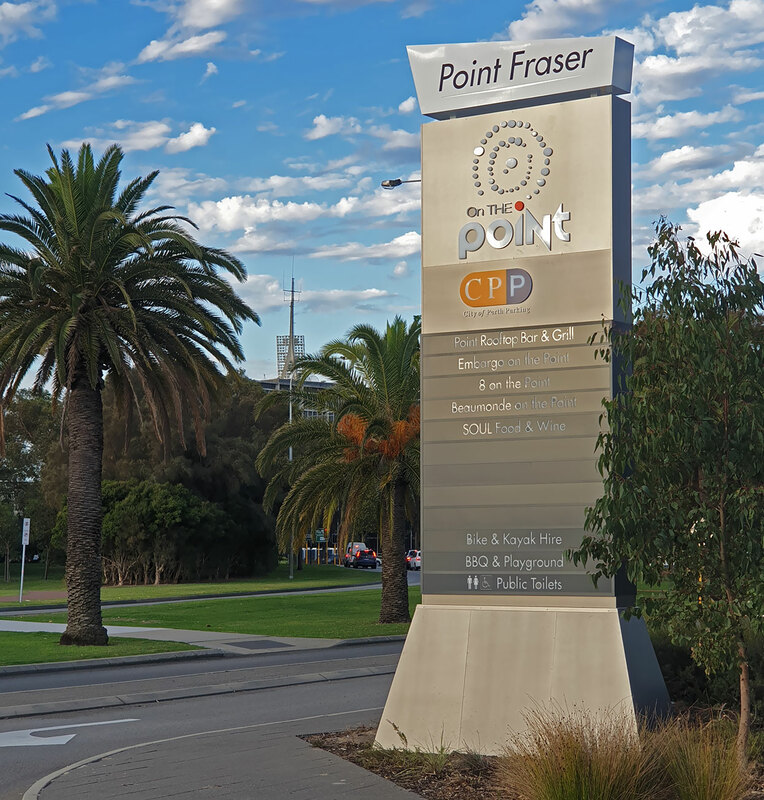 So, we were happy to hear from the legends at Razoreye Design, who asked us to construct and install an eye-catching pylon for one of their clients. The pylon in question had some cool specifications, which we’ll go into more detail about. All in all, we’re proud of the result, and can’t wait to share it with you. Razoreye drew on their incredible design skills to come up with a custom, cutting edge aesthetic for the pylon signage. Our people came on board to construct the new pylon to Razoreye’s specifications and install it, all within a short turnaround. From start to finish, the project was completed within 5-weeks, although one week of that time was taken up with council approvals, which were unfortunately out of our control. 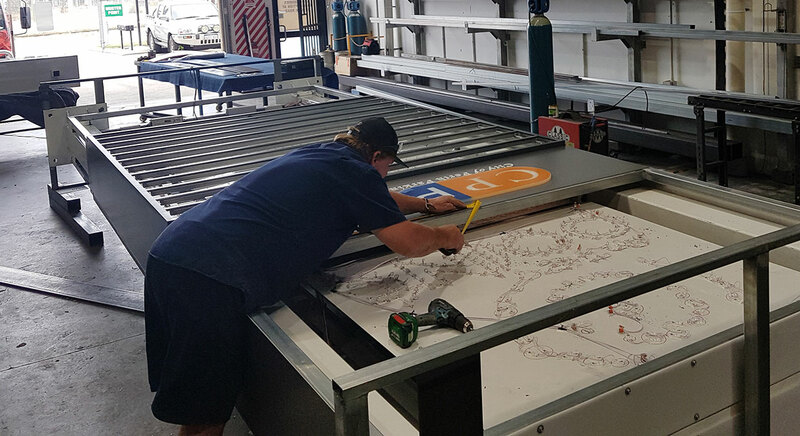 Our signage specialists are sticklers for quality, and know how to turn around a project, without compromise, in record time. Our turnarounds are quick because we have an expert team who backs every project we work on. For this project, we had up to 12 people on the job, including a painter, router, fabricators, an electrician and two rigggers. We also had a Production Manager and an Install Manager, to ensure every element of the process ran smoothly, as well as a Crane Manager and our Managing Director on the scene. All of these people played an integral role in ensuring the project ran efficiently, safely and meticulously matched specs. We had the sign up on the same night Council provided the official green light. Yep, when it comes to meeting deadlines, we don’t mess around. We prepared drawings of the pylon and collated important construction data, then had this information signed off by the engineer in charge. Using these specs, we then fabricated the pylon signage, which meant building the structure, sub-frames and then cladding the pylon. For the sign geeks out there, we used a cool material called plexiglass, which looks black in daylight and illuminates white at night. We also had to match the existing colours of the building, which happened to be a metallic silver with a satin finish (not gloss). This was a challenge for our painter, but he certainly did an amazing job matching up the sign to the building. Partnering with businesses in WA is something we love to do, and we’d like to thank Razoreye for having us on board as part of their team. All in all, the project came in with no variations and we hit all of our milestones within the quoted time frames. Yes, the council did delay the job by a week, but we’re happy to work harder to ensure these kinds of setbacks are only minimal. If you’d like support with constructing and installing pylon signage, we’re happy to help. Get in touch to find out more!